With Google seemingly launching a complex, new web application every week, it’s easy to get caught up in the waves of cool, new stuff hitting the Web every day here at SitePoint HQ. But this past week, I had the opportunity to get back to basics and remember what it’s like to build your very first web page. My girlfriend Jessica is completing a postgraduate teaching degree, and one of her assignments was to produce a web site describing a number of ways in which computers could be used in the classroom. In preparation for this assignment, her lecturer gave a brief demo of Dreamweaver, and suggested that students who couldn’t figure out the program could just design their site in PowerPoint (yes that PowerPoint!) as a series of cross-linked slides and export them to HTML. Now, Jess is studying to teach drama and English, so she could easily have taken the path of least resistance, but as we had just received our office copies of Ian Lloyd’s Build Your Own Web Site The Right Way Using HTML & CSS , I dropped one on her desk and hinted that she might find it interesting reading. Less than a week later, she shot me an instant message one afternoon with a URL in it and asked me, “What do you think?” Bracing myself for the worst, I clicked through and blinked in astonishment at the green check mark that popped up at the bottom of my browser window. The site validated! 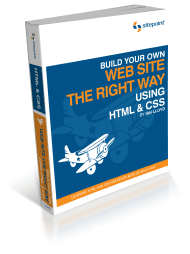 I read the book, which assumed no prior knowledge, and was quickly educated in how to use valid HTML and create snazzy web layouts in CSS, in a way that means I can apply my styling to a number of pages using one style sheet – very handy if I want to change something across all my pages. The result? You’re looking at it. The fact that my first page I created, my homepage, is Valid XHTML 1.0 Strict is an achievement that very, very few first-time webpage builders can claim. In fact, all my webpages pass both HTML and CSS validation 100%, except for the Blogger code in my blog page. But that’s their problem, and another reason why I would ideally use hand-crafted weblogging technology if I were using blogging with students. I should say, even though I know I’m pushing the boundary between exposition and just plain bragging – this website took me only FIVE days to make. From opening the book through to writing these closing words. That fact even has my head spinning. I’m still getting used to my girlfriend preaching the gospel of web standards, but I couldn’t be more proud – not only because Jess did such a professional job on her first-ever web site, but also because Ian has produced a book that can engender that level of enthusiasm in building web sites the right way from someone with no prior web design experience.